I got turned back at the border because I need one more document. 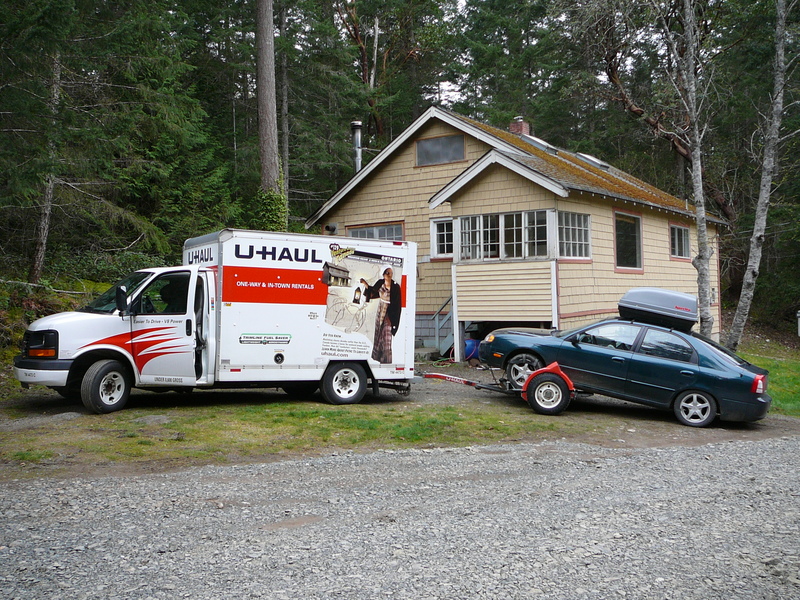 I visited my parents and stayed at my brother’s near Lethbridge, then was forced by Uhaul to bring my equipment back to Calgary to avoid even more extra charges. So my stuff is in storage and I’m in limbo until that final document is in my hands. It is the US gov’t approval of the Church’s application to have me come there that is needed. Meanwhile I’m staying at my son’s condo in Calgary. It is all frustrating, and a growth test in the patience and trust part of my character. I’m trying to roll with it. I’m actually in Calgary at my oldest son’s place as I edit this. We made it here last Monday. 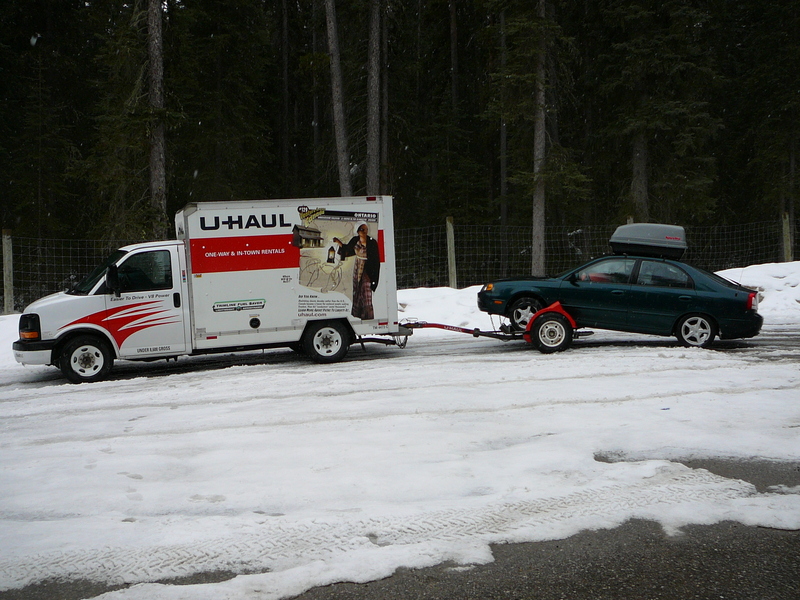 Here is a shot of the rig near Banff Alberta. After two days of loading and deciding what came and what stayed, the rig was ready to roll. The picture was taken just before I hopped in and we drove off. I just wanted to… and it became a faith conversation!!! Argh!!! One of the things I think God has been showing me over many years is that opportunities for what we call outreach or evangelism present themselves all the time – at least that is the case for me – but they are often inconvenient, and you have to learn to recognize them. I have a string of stories of my experiences that point in that direction. In most of them I was just trying to do something ordinary: help a customer out, buy a vehicle, have it serviced, buy a Ferry ticket, watch a Hockey game in a bar, and hire a dog trainer. In each of these situations, some going back to the 1980’s, I was just “being me” or “doing my job” and a faith or spirituality conversation intruded into what I was trying to do. I need to admit that these are only the ones I remember, and that with most of these I was kind of annoyed, saying to God under my breath “I just wanted to… why is this intruding?” Preaching, in my experience, is sooooo much safer than such conversations, because I get confronted with questions from perspectives I’m not used to encountering. I am educated and equipped to address dangers of slight variations of nuances near or within the Theological perspective I was raised in, but these people ask things that are hard. So this post is my going public with my intent to compile these stories. If I don’t do so in the next few weeks and months, feel free to hold me accountable to this commitment. As I complete the stories, I will go back an link it to it’s listing above, so eventually all the stories will be findable from this post.